The Angry Babies were formed in a Motel room off I25 in Albuquerque New Mexico 1986. Bugs Bunner, Eric McFadden and the 7 bass players that followed made a name for themselves in the southwest area. 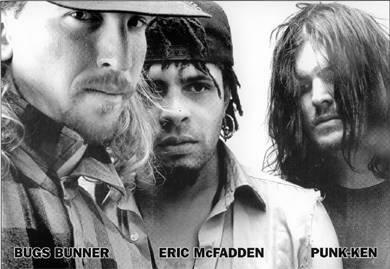 With the release of From the Womb in 1988 with Eric Hollinger on bass, the popularity of the band started to grow. Songs like Pull Out, Beer is Better, and Sloppy Seconds became crowd favorites. In the fall of 88, Eric Hollinger quit for personal reasons and the multitalented David Graham was recruited to fill the slot of bassist. Sold out shows every time these guys played, nothing was off limits. naked guitars, loud women, babies in chains, drunken debauchery, baked goods, it was all there. the band released the live version of From the Womb in 1988 with Erik Hollinger n bass, and in 1990 released the studio version of From The Womb featuring David Graham on bass. The track, War, featured Joey Abbin on guitar. The bands sound started to take a new direction shortly thereafter. Rk Sloane's art proved a great insperation. With the departure of David Graham in 1992, they added Bassist, Punk-ken. Mr. Toyhead was released in 1992, featuring Songs like Frieda & I, Clown gone bad and Baby Needs. It seemed that the interest was there but how do you market this music? The album was recorded in Santa Fe New Mexico. 3 videos were shot and released in the fall. The video for "Clown gone bad" won best independent video by CMJ. A tour was soon set in motion. To quote Dave Graham “the terrible taco bell in a van tour” began and about halfway through the tour, the many Bushmils bottles and Taco Bell wrappers rolling around the floor took its toll on everyone. But that was just one of a few tours on which they embarked. The last one in 1994 was enough to finally break the Camels back. Burnt out and exquasted, the guys headed back home. Daniel was diagnosed with Carpel Tunnel and the band went on a hiatus. Eric plays a few shows a year.